WASHINGTON (WABC) -- Legendary rock star Bruce Springsteen and actor Robert De Niro were named among the recipients of the Presidential Medal of Freedom. Among the 21 names announced by the White House on Wednesday included Ellen DeGeneres, Bill and Melinda Gates, Tom Hanks, Michael Jordan, Kareem Abdul-Jabbar, Robert Redford, Diana Ross and Vin Scully. "The Presidential Medal of Freedom is not just our nation's highest civilian honor - it's a tribute to the idea that all of us, no matter where we come from, have the opportunity to change this country for the better," President Barack Obama said, "From scientists, philanthropists, and public servants to activists, athletes, and artists, these 21 individuals have helped push America forward, inspiring millions of people around the world along the way." The Presidential Medal of Freedom is the nation's highest civilian honor. The awards will be presented at the White House on Nov. 22. Springsteen was raised in Freehold and still lives in New Jersey. Over the past five decades, the stories he has told, in lyrics and epic live concert performances, have helped shape American music and have challenged us to realize the American dream. 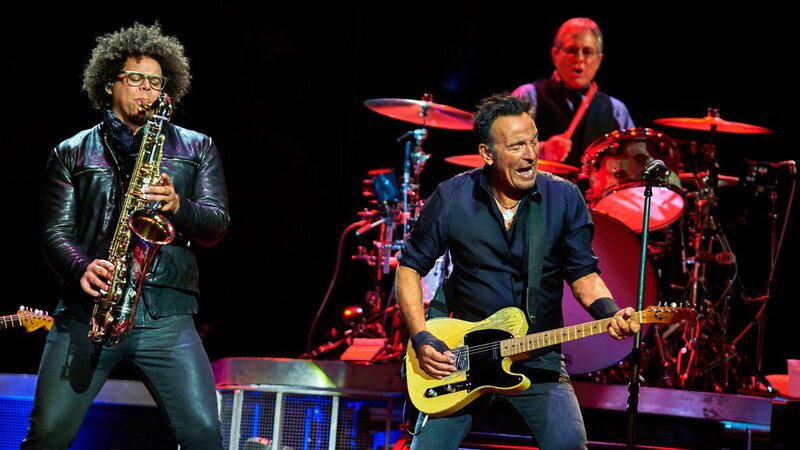 Springsteen is a Kennedy Center honoree and he and the E Street Band he leads have each been inducted into the Rock and Roll Hall of Fame. Kareem Abdul-Jabbar is the National Basketball Association's all-time leading scorer who helped lead the Los Angeles Lakers to five championships and the Milwaukee Bucks to another. During his career, Abdul-Jabbar was a six-time NBA Most Valuable Player and a 19-time NBA All-Star. Before joining the NBA, he was a star player at UCLA, leading the Bruins to three consecutive championships. In addition to his legendary basketball career, Abdul-Jabbar has been an outspoken advocate for social justice. Robert De Niro has brought to life some of the most memorable roles in American film during a career that spans five decades. His first major film roles were in the sports drama Bang the Drum Slowly and Martin Scorsese's crime film Mean Streets. He is a seven-time Academy Award nominee and two-time Oscar winner, and is also a Kennedy Center honoree. Richard Garwin is a polymath physicist who earned a Ph.D. under Enrico Fermi at age 21 and subsequently made pioneering contributions to U.S. defense and intelligence technologies, low-temperature and nuclear physics, detection of gravitational radiation, magnetic resonance imaging (MRI), computer systems, laser printing, and nuclear arms control and nonproliferation. He directed Applied Research at IBM's Thomas J. Watson Research Center and taught at the University of Chicago, Columbia University, and Harvard University. The author of 500 technical papers and a winner of the National Medal of Science, Garwin holds 47 U.S. patents, and has advised numerous administrations. Bill and Melinda Gates established the Bill & Melinda Gates Foundation in 2000 to help all people lead healthy, productive lives. In developing countries, the foundation focuses on improving people's health and giving them the chance to lift themselves out of hunger and extreme poverty. In the United States, the mission is to ensure that all people-especially those with the fewest resources-have access to the opportunities they need to succeed in school and life. The Gates Foundation has provided more than $36 billion in grants since its inception. Frank Gehry is one of the world's leading architects, whose works have helped define contemporary architecture. His best-known buildings include the Walt Disney Concert Hall in Los Angeles, the Dancing House in Prague, and the Guggenheim Museum building in Bilbao, Spain. Margaret H. Hamilton led the team that created the on-board flight software for NASA's Apollo command modules and lunar modules. A mathematician and computer scientist who started her own software company, Hamilton co-created the concepts of asynchronous software, priority scheduling, and human-in-the-loop decision capability, which set the foundation for modern, ultra-reliable software design and engineering. Tom Hanks is one of the Nation's finest actors and filmmakers. He has been nominated for the Academy Award for Best Actor in a Leading Role five times, and received the award for his work in Philadelphia and Forrest Gump. Those roles and countless others, including in Apollo 13, Saving Private Ryan, and Cast Away, have left an indelible mark on American film. Off screen, as an advocate, Hanks has advocated for social and environmental justice, and for our veterans and their families. Rear Admiral Grace Hopper, known as "Amazing Grace" and "the first lady of software," was at the forefront of computers and programming development from the 1940s through the 1980s. Hopper's work helped make coding languages more practical and accessible, and she created the first compiler, which translates source code from one language into another. She taught mathematics as an associate professor at Vassar College before joining the United States Naval Reserve as a lieutenant (junior grade) during World War II, where she became one of the first programmers of the Harvard Mark I computer and began her lifelong leadership role in the field of computer science. Maya Lin is an artist and designer who is known for her work in sculpture and landscape art. She designed the Vietnam Veterans Memorial in Washington D.C. and since then has pursued a celebrated career in both art and architecture. A committed environmentalist, Lin is currently working on a multi-sited artwork/memorial, What is Missing? bringing awareness to the planet's loss of habitat and biodiversity. Eduardo Padron is the President of Miami Dade College (MDC), one of the largest institutions of higher education in the United States. During his more than four decade career, President Padron has been a national voice for access and inclusion. He has worked to ensure all students have access to high quality, affordable education. He has championed innovative teaching and learning strategies making MDC a national model of excellence. Robert Redford is an actor, director, producer, businessman, and environmentalist. In 1981, he founded the Sundance Institute to advance the work of independent filmmakers and storytellers throughout the world, including through its annual Sundance Film Festival. He has received an Academy Award for Best Director and for Lifetime Achievement. Redford has directed or starred in numerous motion pictures, including The Candidate, All the President's Men, Quiz Show, and A River Runs Through It. Diana Ross has had an iconic career spanning more than 50 years within the entertainment industry in music, film, television, theater, and fashion. Diana Ross is an Academy Award nominee, inductee into the Rock & Roll Hall of Fame, and recipient of the Grammy Awards highest honor, the Lifetime Achievement Award. Ross was a recipient of the 2007 Kennedy Center Honors. Diana Ross's greatest legacy is her five wonderful children. Vin Scully is a broadcaster who, for 67 seasons, was the voice of the Brooklyn and Los Angeles Dodgers. In Southern California, where generations of fans have grown up listening to Dodger baseball, Scully's voice is known as the "soundtrack to summer." In 1988, he was inducted into the National Baseball Hall of Fame. Scully's signature voice brought to life key moments in baseball history, including perfect games by Sandy Koufax and Don Larsen, Kirk Gibson's home run in the 1988 World Series, and Hank Aaron's record-breaking 715th home run.